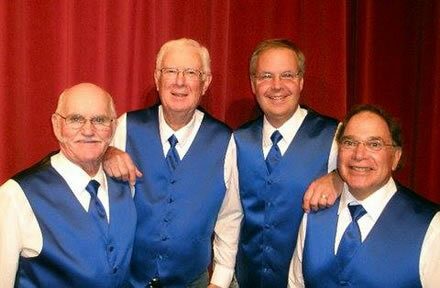 Autumn Serenade, has been registered with the Barbershop Harmony Society for 5 years. Its beginning can be traced back to the formation of the Faculty Forum 20 years ago when four University of Wisconsin-River Falls faculty members performed in “The Music Man” at the St. Croix Valley Summer Theater. Since that time, a number of personnel changes have occurred and the name Autumn Serenade has been adopted. Presently, two of the original members are singing in the quartet - the lead, Curt Larson, retired Physics Professor, and the baritone, Mark Bergland, Biology Professor. They are joined by Roger Bosmoe, retired Forest Lake Postmaster who sings tenor and Duane Hall, retired 3M Health Physicist who sings bass. All are members of the Croix Chordsmen Chorus. SummerTime, an A Capella Quartet, was formed in the fall of 2007. 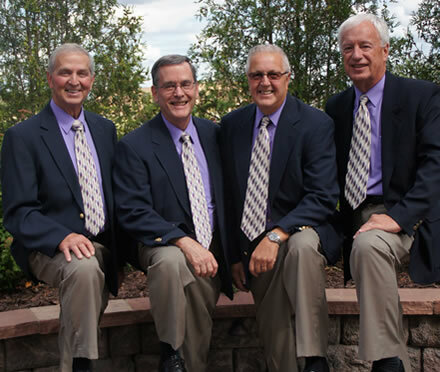 They have performed for various civic, church, corporate and seasonal events, including the Minneapolis Christmas Market, Como Park Centennial Celebration, and Chippewa Falls HOVER Fest for Veterans, and have opened for a national entertainment group. SummerTime routinely performs in the Croix Chordsmen Chorus Annual Spring and Christmas shows. They have also provided music for weddings/receptions, church services, and St. Paul Saints games. 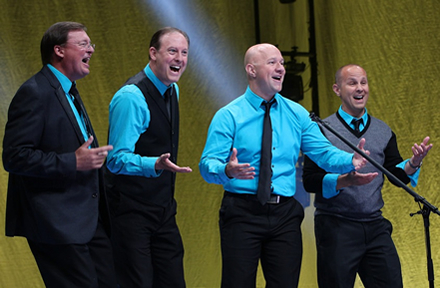 Their repertoire includes new and traditional music, fun songs, and tags sung in traditional barbershop harmony. They are available for weddings, Christmas parties, Care Center events, backyard parties, funerals, corporate events (office parties, sales meetings, celebrations), singing Mothers Day Cards and Christmas Cards, Baby Showers, etc. Members include Duane Schuh - Tenor, Cliff Turnbull as Lead, Loren Paulson singing Bass, and Dale Schueffner at Baritone. Riverchase was formed in 2014 as a quartet that enjoyed singing together and want to convey that to our audiences. BASS– Chuck Brictson has over 46 years with the barbershop society. He has sung in many quartets. He is most proud of his Norwegian heritage. LEAD – Judd Orff has also belonged to the barbershop society for 46 years. He has sung in many other quartets. He is also a Norwegian. Well maybe only half. TENOR – Brian Schultz is a professor at the UW River Falls. He is enjoying his 1 st registered quartet experience after 16 years in the barbershop society. He has NO Norwegian heritage. BARITONE – Mark Bergland has quartet experience and has been a society member since 1984. Mark also has Norwegian heritage. Well three Norwegians and a Finn works for Riverchase. They enjoy singing four part harmony and entertaining audiences large or small. Enjoy the four part harmony music and corny jokes. Chariot Quartet is a registered quartet in the Barbershop Harmony Society. In 2011 Chariot won the novice quartet championship at the 10,000 Land of Lakes Division contest. 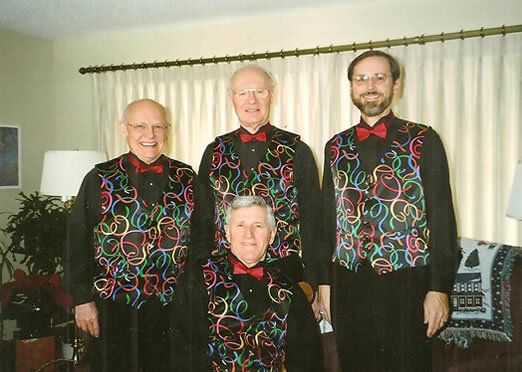 Chariot Quartet provides gospel barbershop music for local churches in their area. 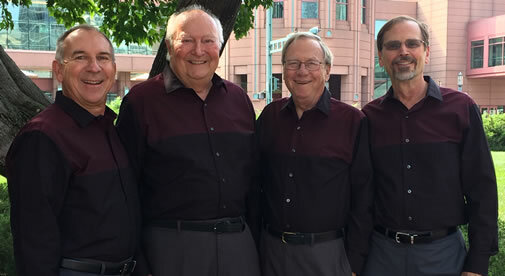 They also sing for local civic groups and are a featured chapter quartet on the fall show of the Indianhead Barbershop Chorus in Polk County WI. Harley Schaffer sings tenor. Harley is a semi-retired truck driver. Harley is a member of the Indianhead Barbershop Chorus in Polk County WI. Clint Gjerde sings Lead. Clint is a retired art teacher from the Amery, WI school district. Clint also sings with the Indianhead Barbershop Chorus in Polk County WI and his church choir. Dan Valentine sings bass. Dan is a healthcare administrator in Luck WI. Dan sings with both the Croix Chordsmen Chorus and the Indianhead Barbershop Chorus. Larry Fisk sings baritone. Larry works in accounting with a firm in Hertel WI. Larry is a member of the Indianhead Barbershop Chorus in Polk County WI, sings with the Bright Nights barbershop quartet and organist for his church. Vocality formed in January, 2007 and was quickly recognized as a entertaining quartet with flawless harmonies and exciting delivery. They were crowned District Champions in the Land 'O Lakes district of the Barbershop Harmony Society and quickly rose to the elite ranks of the Top 20 in the International Barbershop Quartet contests. They have also placed as high as 2nd in the Chicago Harmony Sweepstakes contest. They've performed countless shows across the upper midwest and released their debut recording in the Fall of 2010 which garnered two nominations by the Contemporary Acapella Society for both Best Barbershop Album and Best Barbershop Song. Their second album, "Alleluia", is a compilation of gospel music and has been incredibly well received by listeners everywhere. Their third recording, “Midnight Clear”, was released in November 2013 and features a collection of Christmas favorites with arrangements both old and new. They recently released their 4th album, “Carry On”, which features songs from the 60's and 70's. Their music video, based on the title track as a tribute to Veterans, has been seen by thousands of people all across the country. In addition to their performances they are often the teaching quartet and clinicians for Youth-In-Harmony events. And in October 2016 Vocality was honored to be inducted into the Land O' Lakes Barbershop District Hall Of Fame. 2006 Copyright St. Croix Valley Croix Chordsmen Chorus All rights reserved.